The Steinmetz Pink diamond gets it's name from the Steinmetz Group of Companies, the owners of the diamond, a leading company involved in all aspects of the diamond industry, with headquarters in Geneva, Switzerland, and offices around the world. The Steinmetz Pink rough diamond was cut and polished by the master cutters of Steinmetz Group over a period of two years and transformed into a stunning oval-shaped diamond with a step-cut crown and a brilliant-cut pavilion. The finished diamond, christened the "Steinmetz Pink" was unveiled in Monaco on May 29, 2003, at a public ceremony, and was briefly worn around the neck of super-model Helena Christensen. The diamond is a 59.60-carat, oval mixed-cut, fancy vivid pink stone with a clarity grade of internally flawless (FL). A unique feature of the diamond is the step-cut crown and the brilliant-cut pavilion. The combination of desirable characteristics such as color, clarity, and size makes this diamond an extremely rare and unique diamond indeed. In terms of weight it is the third largest pink diamond in the world, the first and second places being occupied by the Darya-i-Nur, and the Nur-ul-Ain respectively. In terms of color grading it is the largest fancy vivid pink diamond in the world. See table below. Being a relatively new diamond, unveiled to the world as recently as year 2003, the diamond does not have much of a history associated with it, but it is hoped that the diamond will build up it's own myths and legends as time passes by. The Steinmetz Pink, most probably originated in a diamond mine in Africa, but the mine of origin is unknown. The rough stone weighing 132.5 carats was mined by De Beers from an unidentified African mine in 1999. The rough diamond was subsequently acquired by Steinmetz Diamonds. The rough diamond of course was cut by the master cutters of the Steinmetz Group, and undoubtedly the Group ranks as one of the best diamond cutting companies in the world. The Steinmetz Group was involved in the cutting of the renowned Millennium Star and Heart of Eternity diamonds, two stones that originated from the same 777-carat rough stone discovered in Zaire in 1990. They were also involved in the cutting of all the De Beers Company, limited edition, Millennium diamonds collection which consisted of 11 extremely rare blue diamonds, besides the D-color Millennium Star, and was exhibited at the Millennium Dome throughout the Millennium year 2000. The company is also credited with the cutting of the 100.10-carat D-color flawless, "Star of the Season" diamond, that was sold by Sotheby's in 1995 for a record price of $16.5 million, to Sheik Ahmed Hassan Fitaihi of Saudi Arabia, which represents the highest price paid for any diamond in the world at an auction at that time. In the cutting of the Steinmetz Pink, the master cutters of the Steinmetz Group, took extra precautions given the extreme rarity and the value of the diamond. A team of eight cutters working on the diamond took almost 20 months to complete the process of cutting and polishing, an indication of the extra care taken in handling this valuable diamond. It is said that more than 50 models of the diamond were made before the actual cutting took place. Another unique feature about the cut of this diamond is the step-cut crown and the brilliant-cut pavilion. the overall shape of the diamond was oval. The finished diamond weighed 59.60 carats. Hence, there was a loss of 72.9 carats or 55% of the weight of the rough diamond during the processing of the diamond. In other words the master cutters of the company had attempted to maximize for quality at the expense of quantity, and the result was the stunning oval mixed-cut pink diamond, with the highest color grade of fancy vivid pink and clarity grade of internally flawless. The finished diamond was unveiled in Monaco on May 29, 2003, at a public ceremony, and was briefly worn around the neck of super-model Helena Christensen. The Steinmetz Pink diamond is exhibited in the year 2003 at the National Museum of Natural History of the Smithsonian Institution in Washington D.C. In the year 2003, the Steinmetz Pink was part of the "Splendor of diamonds" Exhibition held at the Smithsonian's National Museum of Natural History, in Washington D.C. between June 27th and September 30th, that also featured other famous diamonds such as the Millennium Star, the Alnatt diamond, the Pumpkin diamond, the Heart of Eternity, the Ocean Dream, and the Moussaieff Red. 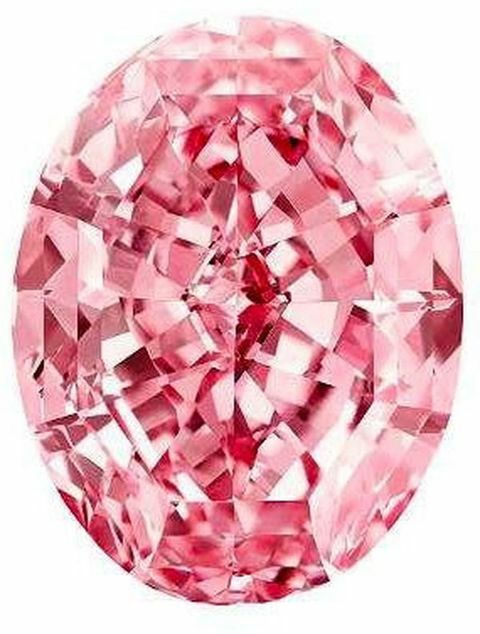 Again in the year 2005, the Steinmetz Pink was part of the "diamonds" exhibition, held at the Natural History Museum in London, between 8th July 2005 and 26th February 2006, that featured a star line-up of eight of the world's most incredible diamonds displayed together for the first time . This included the De Beers Millennium Star. the Steinmetz Pink, the Incomparable, The Ocean Dream, The Moussaieff Red, the Heart of Eternity, the Alnatt, and the 616-carat Kimberley Octahedron Diamond. The exhibition also included the Eureka, the Shah Jahaan and the Aurora Collection, a set of 296 naturally colored diamonds, totally a staggering 267.45 carats. The Steinmetz Group has seven decades of experience in the diamond industry. They are involved in all aspects of the industry, such as mining, cutting, polishing, and the manufacture and marketing of high-end diamond jewelry. Recently the group acquired 65% of the shares in the Sierra Leone Diamond Mining Company, that owns and operates the Koidu Kimberlite diamond mine and Tongo Fields exploration area in Sierra Leone. The remaining interest is held by Magma Diamond Resources Ltd, which is also part of the Steinmetz Group. As a part of it's unique marketing strategy the group has promoted the glamour of diamonds at various international events such as the Oscars, the Baftas, the Monaco Grand Prix, and exhibitions held at the Natural History Museum of the Smithsonian Institution, and the Natural History Museum in London. The Steinmetz Group is also involved in joint ventures with other renowned companies. In the year 2005 , the Steinmetz Group established a joint venture with the international jewelry auction house Sotheby's , known as "Sotheby's Diamonds" offering the rarest and most desirable diamonds in the world and exquisite diamond Jewelry. The first jewelry collection of this joint venture company was unveiled in New York and Hong Kong in December 2005. The Steinmetz Pink diamond was first sold to an anonymous buyer for an undisclosed sum by a privately negotiated sale by its owners the Steinmetz Group in the year 2007. The new anonymous owner of the diamond renamed the diamond, the "Pink Star" diamond. Since then there appears to have been no changes in the ownership of the diamond. However, the anonymous owner of the "Pink Star" diamond has entrusted the auction house Sotheby's to sell the diamond at its Geneva "Magnificent Jewels" auction coming up on November 13, 2013. A pre-sale estimate of US$ 60 million has been placed on the "Pink Star" diamond, which undoubtedly would be easily achieved, given the unprecedented demand for high-quality pink diamonds, and the fact that a pink diamond of lesser color grade - fancy intense pink - and less than half the weight of the "Pink Star" diamond, viz. the 24.78-carat, fancy intense pink "Graff Pink" diamond, registered a record price of US$ 46 million at a Sotheby's auction also held in Geneva in November 2010. Incidentally this was also the highest price ever registered by a single diamond/gemstone at an auction, or the most expensive single jewel ever sold at an auction. Pink diamonds are also extremely rare like red or purple diamonds, but in terms of size pink diamonds, are much bigger than red diamonds. The 1st, 2nd, and 3rd largest pink diamonds in the world, the Darya-i-Nur, the Nur-ul-Ain and the Steinmetz Pink are respectively 186 carats, 60 carats, and 59.60 carats in weight respectively. In comparison the 1st, 2nd, and 3rd largest red diamonds in the world, the Moussaieff Red, the "Red Diamond" and the "De Young Red" weigh only 5.11, 5.05, 5.03 carats respectively. Thus in red diamonds, rarity seems to be combined with reduced size. The only source of pink diamonds in the world prior to the 18th century, was the Kollur Mines near Golconda, in Andhra Pradesh, southern India. 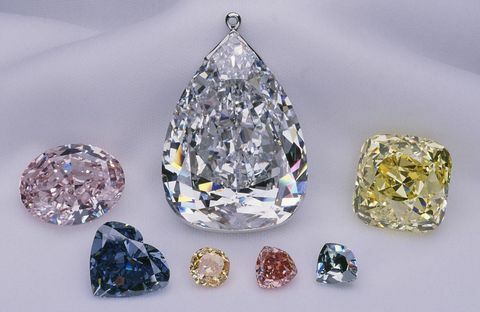 The Darya-i-Nur, The Nur-ul-Ain, the Conde Pink, the Hortensia, and the Shah Jahan, all famous and historic pink diamonds, originated in the Kollur mines of southern India. After the discovery of diamonds in South Africa in the late 19th century, the diamond mines in South Africa, became the only source of pink diamonds in the world. The world's largest fancy vivid pink diamond, the Steinmetz Pink, was probably discovered in the diamond mines of South Africa. Likewise the Mouawad Pink and the Mouawad Lilac might also have originated in the diamond mines of South Africa. But today, the world's main source of pink and red diamonds is the Argyle diamond Mines in western Australia. The pink diamonds produced in the Argyle mines are small and have an average weight of about 1.0 carat. They are also extremely scarce. The frequency of production is 1.0 carat of pink diamonds for every 1,000,000 carats of rough diamonds. This works out to a percentage of 0.0001 % of the total production. However in spite of it's scarcity the Argyle mines have become a consistent source of pink diamonds in the world as the annual production of pink diamonds is about 50 carats. The exceptional pink and other colored diamonds are sold each year at special auctions known as "tenders", held in major cities around the world such as New York, Sydney, Tokyo, Hong Kong, London and Geneva. Prices of over $100,000 per carat have been achieved for the rare pink diamonds. Pink diamonds are type 11 diamonds that do not contain any detectable quantities of Nitrogen. Type 11 diamonds are sub-divided into two:- type 11a and type 11b. Type 11a diamonds do not contain any impurities such as Nitrogen or Boron in their crystal structure, and therefore are absolutely colorless. Such diamonds constitute about 1-2% of all naturally occurring diamonds. However some type 11a diamonds can undergo plastic deformation while rising up to the surface of the earth from the earth's mantle along Kimberlite and Lamproite pipes. Such structurally deformed crystals can absorb light in different regions of the spectrum giving rise to rare colors such as pink, red, Purple, orange etc. Thus pink color in diamonds is caused by structural anomalies in the crystal structure of colorless diamonds. The following is a list of famous pink diamonds in the world arranged in descending order of carat weights, as at April 2013. According to this list the Steinmetz Pink aka the "Pink Star" diamond is the 3rd largest pink diamond in the world, after the 186-carat Darya-i-Nur diamond and the 60-carat Nur-ul-Ain diamond. However, in terms of its fancy vivid pink color, the "Steinmetz Pink" aka the "Pink Star" diamond is the largest fancy vivid pink diamond in the world. Please do not copy our tables. We may be compelled to inform the search engines or file a DMCA request if our content and tables are plagiarised. 2) Pink Star Diamond - From Wikipedia, the free encyclopedia.